Coffee startup Rite Development Lab raised more than $2 million in crowdfunding over the last year with the promise of the perfect „no mess“ French press, which it calls Rite Press. However, hundreds of Kickstarter and Indiegogo backers now say that after months of delays, they still have not received the French presses that they were promised in return for their pledges. In early February, founder Sargam Patel said that the company had run out of funding for Rite Press and asked backers for more money, according to an email viewed by Business Insider. 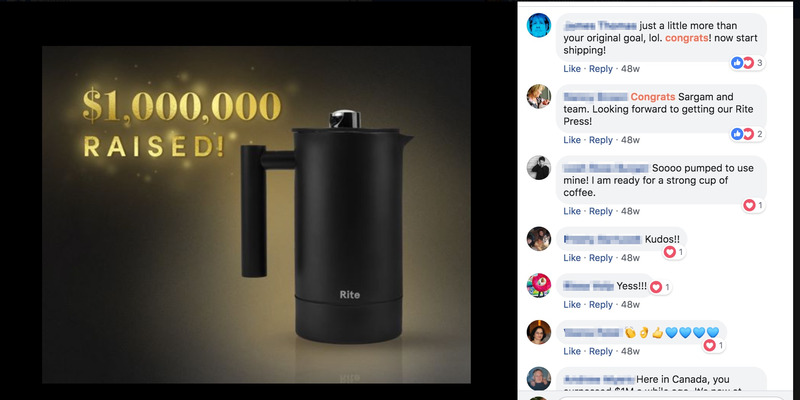 Backers are complaining, calling Rite Press the „Fyre Festival“ of French presses, and vowing never to use Kickstarter again. 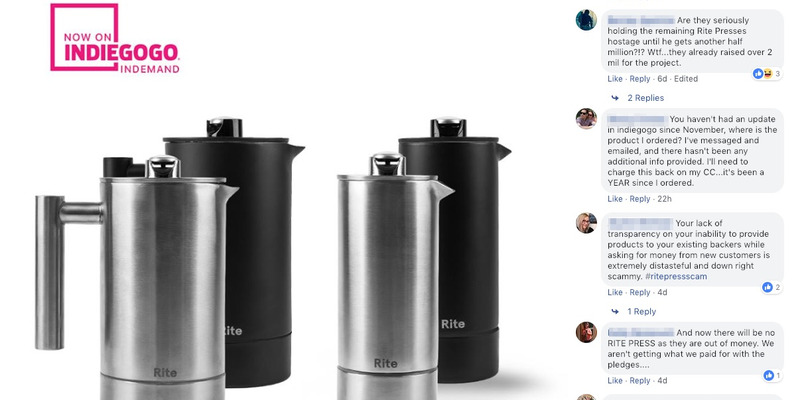 Rite Press was supposed to reinvent the French press. More than a year after launching, the coffee startup behind Rite Press has raised more than $2 million in crowdfunding. But, backers aren’t celebrating. Instead, hundreds of supporters of the startup’s Kickstarter and Indiegogo campaigns say that their Rite Presses are nowhere to be found. 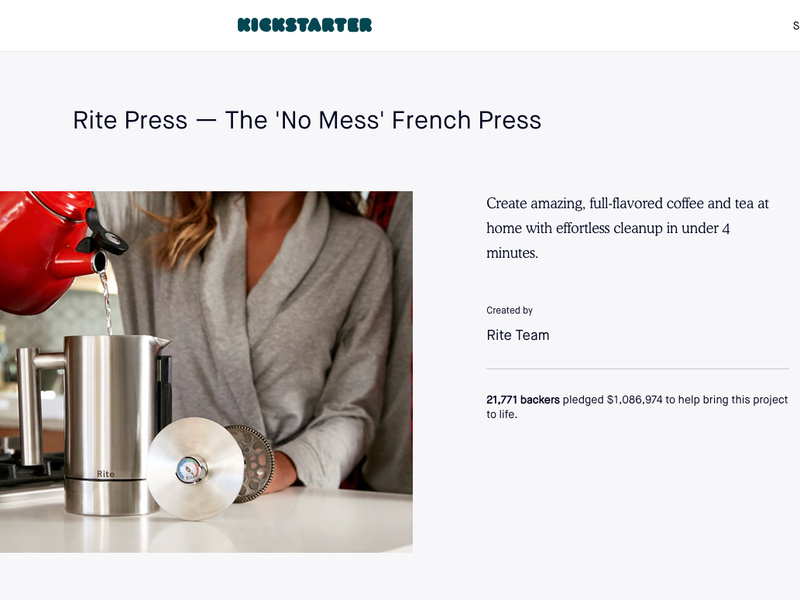 As backers post their complaints and the company asks for even more funding, some are now calling Rite Press the „Fyre Festival“ of French presses. „If I didn’t feel so angry and ripped off, I’d think the whole project was a hilarious joke,“ said Maggie Lang, a Kickstarter backer who told Business Insider she contributed to the campaign in March 2018 and still has not received anything. „This has … made it so that I will never partake in another Kickstarter campaign,” said Cindy Swain, another backer. 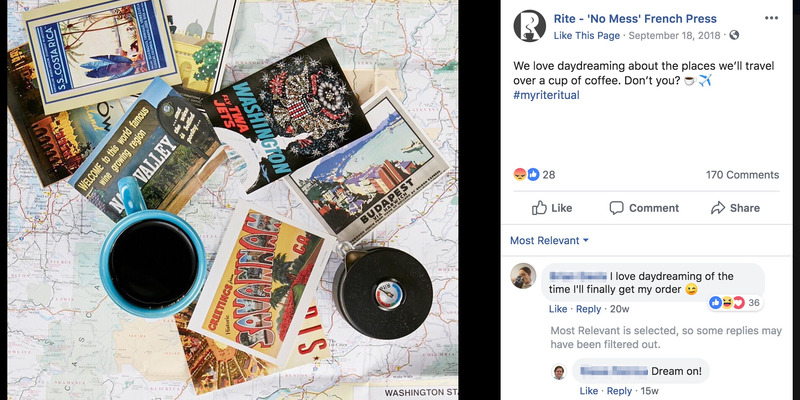 Rite Press‘ parent company, Rite Development Lab — also referred to as Rite Company or simply Rite — did not respond to multiple requests for comment Business Insider sent via email and the company’s social media channels. In January 2018, Rite captured coffee lovers‘ attention with a video of company founder Sargam Patel using a press with a removeable base for easy cleanup. It appeared elegant but functional, with a patented bottom chamber that could be easily removed. Available in stainless steel or ceramic, the French press even included a thermometer and a timer to guarantee the perfect cup of coffee. The campaign blew past its original goal of $20,000 in just 24 hours. Rite went on to raise more than $1 million on Kickstarter, making it the most-funded coffee campaign in the site’s history. It was written up in TechCrunch and seemed to be an example of what Kickstarter does best — provide a platform for founders with ideas that people are excited about. Rite was originally meant to start shipping half-liter and one-liter presses in March 2018, according to the Kickstarter campaign page. As of early February, the campaign still lists those original dates. Instead, Rite pushed back delivery in late March, saying that the company needed to wait for Kickstarter to deliver funds. Month after month, Rite posted updates saying that shipping was once again delayed, citing manufacturing challenges, design changes, and issues with testing. By July, Rite had raised more than $2 million between Kickstarter and a $1.3 million Indiegogo campaign that had launched in May. Yet, four months after the first group of presses were supposed to have been delivered, it seemed no one had received anything. Rite’s social media accounts were flooded with complaints. Even posts with innocent, inspirational photos featuring coffee were bombarded with questions about when people could expect their presses to arrive. According to updates the company posted on its Facebook page, it began shipping some presses internationally in August. In October, Rite debuted a plastic version of the French press called Essential+, which is now selling on Amazon for $49.99. Backers were offered the choice to switch to the Essential+ instead of the original option. According to an email Patel sent to backers, which was viewed by Business Insider, the company did not use money from the Kickstarter campaign to fund the Essential+, instead raising funds from outside investors. In November, some American backers said that they had begun to receive their Rite Presses. However, as of February, hundreds of Kickstarter and Indiegogo backers have said on the campaign pages that they still have not received the press — and that they’re running out of hope that they ever will. „I think [Patel] had a good idea to improve what we don’t like about French press, and a crappy business plan,“ Lang said to Business Insider. In early February, Patel revealed in a video to backers that the company had run out of funding for Rite Press. In the video, he asked that backers — including those who had already received a half-liter press — to consider giving $30 to $40 more each to fund the project. The next week, he sent a long email to backers — the 25th update to the project. „I will continue to work on fulfilling backer rewards but it is going to take much longer than anyone would like without additional funding via backer support,“ Patel wrote in the email, which Business Insider viewed. According to Patel’s email, the company was working with a factory in China that did not meet Rite Press‘ quality standards. The factory cut ties with Rite but refused to return money for the material deposits and tools, resulting in increased costs at the second factory, Patel said in the email. These costs added up. According to spreadsheets Patel shared in the email, the Kickstarter campaign raised $1,091,979, but the campaign ultimately cost $1,876,060. According to the email, people who pledged with the hope of receiving a half-liter press gave $35.26 on average; the cost of making and shipping each press ended up being $66.72. As a result, Patel said in the email, the company would be unable to give refunds and would only be able to ship rewards „as funds become available.“ The founder said he had already invested $280,000 of his own money into the project. Patel’s new plan, as outlined in the email, is to raise more money from backers and from selling both the plastic Essential+ on Amazon and a version of the original French press on the company’s website. The standard cost for a one-liter press — now available for pre-order — will be $130, $100 more than the minimum pledge for the Kickstarter. As Patel seeks funding, many furious backers seem unlikely to give Rite another penny. After months of complaints, the comments on Rite Press‘ Kickstarter and social media pages are almost uniformly negative. „New company tag line: ‚The Fyre Festival of French Press,'“ reads a third. David Gallagher, a representative for Kickstarter, told Business Insider in an email that roughly 9% of projects on the site fail to deliver rewards, and that the ones that do often take longer than expected, according to a study by Ethan Mollick, a professor at The Wharton School of the University of Pennsylvania. Last week, in the 25th update, Patel said that backers would receive an email „early next week at the latest“ with their options. As of Wednesday, backers who spoke with Business Insider said they had not received an email.